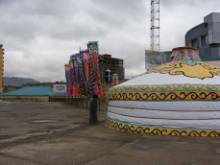 The Mongolian National Circus has been draped with lights for several days now, and only casual tourists passing through are unaware of the reason, or believe that it is still a celebration of Mongolia's two Olympic gold medals. 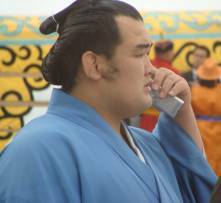 But in the steppes, they are only talking about one thing: the first Mongolian basho, in serious doubt after the recent riots at election time, will finally take place on 27 and 28 August 2008. It is Yokozuna Asashoryu who has organised it, and I must say that it will turn out perfectly. By 8 a.m. dozens of police officers arriving at the venue are meeting inside in the circus tent to receive orders from their superiors. They are being deployed rapidly throughout the region to close it to traffic and to place a cordon around the area to prevent pedestrians from coming too close. A ger has been assembled to one side for televised interviews. Many people are jostling around, carrying cardboard boxes full of food and items for sale inside the circus. Others are setting up stalls and plastic tables and chairs, and starting to cook kebabs. At about 9:30, the first happy ticket holders are flocking around the circus at the few authorised places, hoping to spot their heroes as soon as they show themselves. 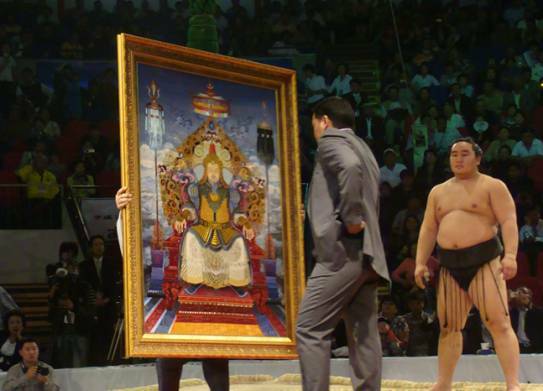 Those who aren't lucky enough to have an entrance ticket (they are extremely expensive compared with the average wages in Mongolia) will follow the basho on giant screens all round the town centre, or in front of their television station, which is better than nothing, at least. 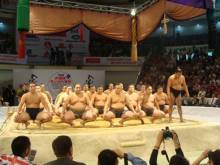 The Mongolians are very fond of sumo. 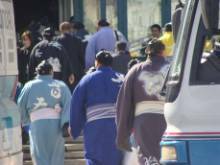 When the honbasho are broadcast on television, almost everything comes to a standstill, both in the town centre and in the steppes. The stockmen and their families and friends are to be found in the ger, following the bouts on old television sets, with poor reception, and making knowledgeable comments about every move. Some people have made big sacrifices to find enough money for a ticket, just short of selling their souls, perhaps selling a cow or three or four sheep to satisfy their passion. Suddenly, around 11:30, police sirens sound and then limousines arrive carrying the yokozuna and the sanyaku, followed by coaches carrying the other rikishi. The traffic lights have been set to green for their arrival. The crowd of spectators, which has been reasonably packed since early morning, cheers their heroes, or at least those that they can recognize, because they are a long way away. Quite a time goes by while the rikishi pose for photographs, before at last - the taiko sound, inviting the spectators inside the circus. My heart is beating fit to burst: it is my first basho. In the circular corridor alongside the arena, acting as the shitaku beya, there are various stalls to tempt the spectators, who spread around delightedly to admire or buy a tegata or a fan showing a picture of their favourite wrestler, a yukata or an article in cashmere. 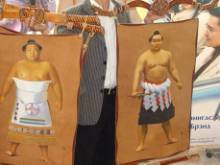 A young man holds in front of him hand-painted leather hangings representing Asashoryu and Chiyotaikai. I ask the price for the one of the Yokozuna and the salesman replies smiling, $1000. Okay, another time perhaps! The most urgent thing is to get something to eat before the basho starts. You can choose between Japanese dishes (sushi or yakisoba) and Mongolian dishes (kebabs, soup and various sorts of sandwiches). I'm hoping that I will soon be lucky enough to see my favourite rikishi close-up. Up to now I have only seen them as tiny pictures moving around on my computer screen or on television. And straight away, an unusual crowd movement warns me that something is happening in the distance over there. 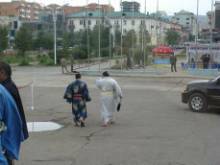 I approach with my camera ready to capture the moment and I notice the backs of Iwakiyama and Aminishiki leaving the circus tent to go into the little streets of Ulan Bator, for a reason known only to themselves. I am luckier with Kotoshogiku, deep in conversation on his mobile not far away from me, and looking my way so that I can capture him on film. I reach the cloakrooms for people with tickets costing 100,000 tugriks (a little under $100), and I have the pleasant surprise of receiving a paper bag full of gifts: a brochure describing the careers of all the rikishi, a bottle of beer, a fan featuring the two yokozuna, a notebook, a sachet of perfumed hand-wipes and all sorts of advertising materials from the sponsors. I'm wondering what I will receive tomorrow with my 200,000 tugrik ticket! I also buy a T-shirt which is a souvenir of the basho at $10 and finally make it into the lair of the Sumo Gods. You can almost feel the spectators who have reached their places quivering with joy. I am lucky enough to have a seat in the second row, right in the centre, just opposite the performers' entrance. I'm already enjoying myself. 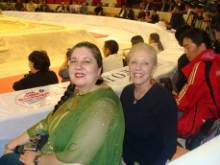 A few minutes later I am thrilled to meet two famous figures from the world of sumo fandom, Barbara Ann Klein (a close friend of Asashoryu) and Katrina Watts (a sumo commentator for Australian television and president of the Australian Amateur Sumo Federation), who come and sit down just in front of me. Suddenly, the atmosphere changes. The yobidashi have quietly arrived and are preparing the dohyo. Some rikishi are already visible, warming up on either side of the performers' entrance. I recognize a familiar profile. Yes, it really is him, it’s Chiyotaikai. I'm so excited. It's really it this time. I'm going to see "my" rikishi close up! The opening of the basho is being announced in Japanese, then in Mongolian, and those rikishi present from juryo and makuuchi divisions solemnly make their entrance, accompanied by equally solemn music. Asashoryu is right opposite me, only 4 m away and concentrating hard. My emotions are at their peak! Suddenly a spectator, unable to contain his joy, cries out "Kaio! ", which makes the yokozuna laugh. But he quickly regains his seriousness while the Japanese and Mongolian national anthems are played in turn. Asashoryu sings both anthems spiritedly. The Mongolian basho has officially begun. 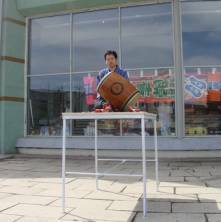 Then comes the presentation of the minarai, which is unusual. Generally it is only the sekitori (and sometimes the makushita) who participate in jungyo. But it is an unexpected opportunity for the young Mongolians in jonidan and sandanme to be able to see their families and friends at last and to be under the spotlight in an unusually full room. 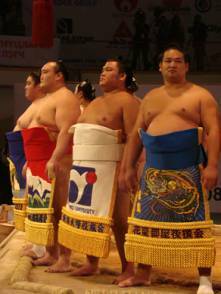 The Nihon Sumo Kyokai was kind to them and quite exceptionally authorised the trip. 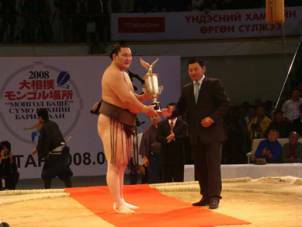 The 19 young Mongolian wrestlers make their entrance, squat in rows on the dohyo and then stand up and bow when their shikona is called out, followed by their Mongolian name. One recognizes in turn Toranoyama, Torugawa, Dewahikari, Sakigake, Seiro, Daionami, Taika, Kagamio, Hoshizakura, Oniarashi, Arawashi, Kyukushuho, Sensho, Shironoryu, Hoshikaze, Daitensho, Tokusegawa, Shotenro and Daiyubu. They are all there. They wouldn't have missed this for anything. It is no accident that there are 19 of them, an odd number. As there are only five juryo rikishi, Shotenro and Daiyubu will only fight on one day, but they will have the honour of facing a sekitori. A movement draws my attention to the west side. A long string of budding rikishi has just lined up at the foot of the dohyo. It is time for the much anticipated kodomo-zumo, sumo with children. As everywhere else, the spectators love to see cherubs in mawashi facing these huge semi-legendary heroes, from back in the depths of time. It is Kyokutenho, Tokitenku and Koryu to whom the role falls on the first day to amuse the gallery, and who take a cunning pleasure in it. The miniature rikishi grab, push, pull and do everything they can, and their heroes push them back, pick them up and make them fly through the air, before gently putting them out of the ring. Kyokutenho rehearses his future role as an oyakata by making the children who have forgotten bow to their opponent before they leave the ring. Play time is over and the minarai bouts can now begin. The young wrestlers all want to show their relatives what they can do and they go all out. The bouts are normally very competitive and fairly violent. The desire to shine wins out over the fear of injury. The Mongolian spectators are very warm and enthusiastic and really knowledgeable. They encourage their young colts as they should, and perhaps among them is a yokozuna-in-waiting. That is something they are beginning to get used to, Mongolian yokozuna! 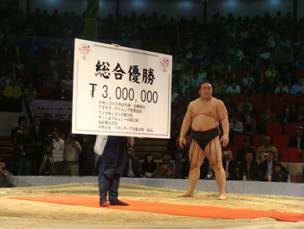 The dohyo is cleared at the end of the minarai bouts to allow room for Asashoryu's tsuna to be made. It is a very ritualised procedure, where every move is of almost clinical precision. Each rikishi, wearing white gloves, knows exactly what he has to do and does it well. This moment is very serious and takes great concentration which rubs off on all the spectators right to the back row. After the appetisers, it is time for the main course: the tournament. The rikishi introduce themselves in the makuuchi and juryo dohyo-iri in a relaxed atmosphere, smiling and waving to those around them. Kaio and Chiyotaikai receive rapturous applause. The main absentees are ozeki Kotomitsuki, in hospital with kidney stones, Homasho, with a wrist injury and Tamakasuga, also Roho, Hakurozan and Wakanoho for their smoking activities. As an interlude, there follows a short recital of taiko drumming. Unfortunately, as there hasn't been an interval, many spectators take the opportunity to go outside for a breath of air, a drink, or a visit to the toilet. For his yokozuna dohyo-iri, to everyone's surprise, Asashoryu appears with his son in his arms. The boy is wearing a tiny white mawashi and seems to like the public applause. Asasekiryu has given up his role of tachi-mochi (sword-bearer) to Hokutoriki so that he can have his hands free to look after the little boy during the yokozuna's performance. 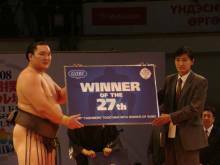 As for Hakuho, he waits gravely to perform a beautiful dohyo-iri. And then at last the tournament itself begins. Even if the rikishi are obviously not going all out, as they do in the honbasho, it is quite hard to realise that when you're actually there. The wrestlers are good actors and it all appears to be genuine. There is one bout which looks artificial even to me: that between Aminishiki and Takamisakari on the second day. Takamisakari delights the audience with his famous warm up ritual. As in Japan, the crowd beat time along with his movements and shout with him. I've never before seen, in any sport, a less partisan crowd than the Mongolian public. The spectators cheer their favourites of whatever nationality. 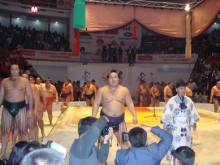 It isn't that unusual to see a Japanese rikishi being cheered even when he is fighting a Mongolian rikishi. As for Kaio, he receives enormous cheers and applause from the Mongolian spectators. long stare-outs between Kotoshogiku and Tokitenku - they almost rang true! the enormous slap, which could have taken a horn off a yak, dealt out by Ama on Takamisakari at the end of their bout. "Robocop" was left completely groggy. a fantastic quarter-final encounter between Chiyotaikai and Hakuho, that Hakuho won with a textbook uwatenage. and, to the great joy of the public, every mono-ii results in a torinaoshi. We may have paid dearly, but we get our money's worth! There is one brief moment of anxiety, however, both for the organisers and the spectators: between the two semi-final matches, the circus tent is suddenly plunged into complete darkness. There is just time to wonder whether it is going to put a stop to everything, given how often there are power cuts in Ulan Bator, when the lights come back on, to everyone's great relief. The day ends with a majestic victory by Hakuho, such as we have become used to seeing recently. The progress of the second day is virtually identical to that of the first, other than for the fact that with my 200,000 tugrik ticket (nearly $200) I have received a bottle of "Yokozuna" whisky and a leather diary as well as other gifts. Today we are spared the official speeches in two languages and go straight into the presentation of the minarai, followed by the kodomo-zumo. This time it is Ama, Asasekiryu and Kakuryu who are responsible for giving a sumo lesson to the little rikishi, whose eyes shine with pride at fighting with their heroes in front of everyone. Asasekiryu, who is very pleasant natured, bursts out laughing when he sees one little boy approaching, as most of them are skinny little fellows. He gently waltzes them around the ring before letting himself be pushed out of the circle, to the applause of the crowd. Ama then pretends to be a malicious gyoji and calls a matta. A young boy of about 13 or 14, who clearly has a gift for sumo, puts up such strong resistance to Kakuryu that Asasekiryu decides to challenge him directly afterwards. The boy gives it everything. It is his hour of glory. Ama, not wanting to be left out, also challenges him, behaving like he is the "terror of the ring". This boy has been lucky enough to "defeat" three rikishi, and none of them weak ones, and to make himself look good in front of 3000 people! The minarai bouts, again violent and committed, warm up the spectators for the sekitori tournament. This time it is yokozuna Hakuho who will have his tsuna made, in the Shiranui style. 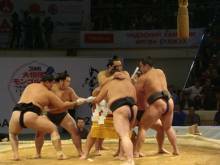 Then the juryo and makuuchi dohyo-iri allow us once again to admire their splendid kesho-mawashi from close-up. Ama, on this occasion, is carrying a baby in his arms. He isn't the only one, because Hakuho shows up for his dohyo-iri with a tiny little boy in his pyjamas, certainly one of his nephews. Unlike with Asashoryu's son yesterday, this little tot doesn't enjoy the outing at all and wails with terror. Kyokutenho, to whom the yokozuna has entrusted him, doesn’t manage to calm him down despite the infinite imagination that he demonstrates. He rocks him, plays with him, bounces him on the clay like a balloon, all the while trying to keep concentrating, but nothing works. 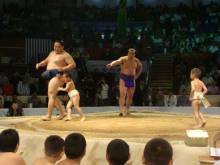 The little boy doesn't calm down until he is outside the dohyo and in Hakuho's arms. After the short recital of taiko drumming, the juryo and makuuchi bouts commence at last. I am consumed with uncertainty: will Asashoryu, with his elbow triply bandaged, do better than yesterday, when he was eliminated in the quarter-finals by his stablemate Asasekiryu? This Mongolian basho is his brainchild. He deserves to win it in my humble opinion. The tournament proceeds, with its good and bad moments. Chiyotaikai and Hakuho give us another brilliant spectacle, Chiyotaikai attacking Hakuho with a violent nodowa, which he doesn't manage to keep up, giving a clear advantage to the yokozuna. Tochinoshin is beaten by Chiyohakuho thanks to a spectacular utchari. As for Kaio, he doesn't go all out, no doubt fearing a career-ending injury. Asashoryu easily reaches the quarter-final, where he, just as I suspected he would, eliminates Kaio. In the semi-final he meets Kotooshu, whom he defeats with an impressive shitatenage. I regain hope. He is close to victory, but must still fight the winner of the other semi-final, Hakuho against his countryman Tokitenku. 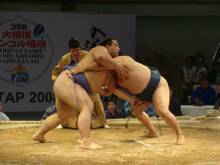 Against all expectation, it is Tokitenku who beats the yokozuna by yorikiri. Asashoryu is in the final, so he's nearly there. I hold my breath. When the two competitors climb into the ring, I don't hold back and shout encouragement to my favourite yokozuna, together with my neighbour on the left side, who is also a fan of Asashoryu. The yokozuna disposes rather easily of Tokitenku, brilliant as he has been up to this point, by hatakikomi. So now, we come to the grand final, between the two yokozuna. 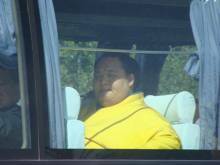 Hakuho begins by pushing his opponent violently and driving him back to the tawara. I shiver, imagining Asashoryu beaten already. But he manages to push his opponent back, push forward his pelvis so as to push him out using yorikiri, but Hakuho then tries a leg trip that Asashoryu counters immediately with a superb uwatenage and wins the tournament. At the end of the closing ceremony, Asashoryu thanks his fans, who shout out their warm thanks in their turn. He is moved to tears. I leave the arena in a fairly euphoric state and walk around a bit in the shitaku beya, in the hope of being able to take a few more pictures of the rikishi who will be leaving soon. This time I am luckier. Several rikishi are available to have their photos taken and to sign autographs, which the happy spectators who were lucky enough to get near them would never miss. Other rikishi leave without stopping but are grabbed by an overenthusiastic crowd, and only escaping without harm because of their unusually powerful physiques.. Asashoryu has to re-establish calm, because he is gripped by a dense crowd preventing him from either in breathing or moving forwards. My camera battery is flat, so I can only watch the yokozuna moving away after having signed autographs for the lucky few. I go home riding on an immense high, wishing like everyone else here that this tournament had not ended and that it would not be the last in Mongolia. 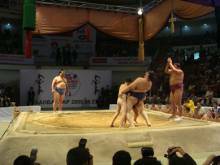 Day 1 and Day 2 results for the Mongolian Basho, with the winning technique for each match.